The criminal penalties associated with an attempt to sell or distribute a drug can be confusing, as you may be charged with possession with intent to sell even if you honestly had no intention to sell any of the substance. The following is an explanation of Virginia’s classification of various controlled substances as well as the difference between possession and possession with intent to sell or distribute. If you are charged with a drug crime, possession alone is likely the charge that carries the least penalties. Virginia and federal charges for possession of controlled substances are severe, but possession alone most likely means that you were not being charged with a substantial amount of controlled substances. Even if a drug is not found on you, it may be decided that it is in your possession because it is within your control. To be charged with possession, the drug must have been found on your person, your vehicle, in your home, or other property. 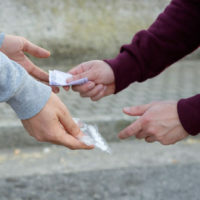 Intent to sell can be construed one of two ways: 1) with actual evidence that you were attempting to sell the drug, such as eye witness statements, being caught in the act, drug paraphernalia, customer accounts, large amounts of money, and packaging, or 2) the amount of the drug in your possession was too large to be of personal use. Quite often, it is this second scenario that law enforcement will use. You can also be charged with intent to sell or distribute even if you do not actually have any drugs in your possession (or drugs in your control). If you have been charged with any type of drug crime, do not hesitate to contact an attorney immediately. Whether the charge is a misdemeanor or a felony, the penalties can be life-altering. Call the Loudoun County, Leesburg, Winchester, Fairfax, and Prince William drug crimes criminal defense attorneys of Simms Showers, LLP today at 703-997-7821.